Polydor 841126. 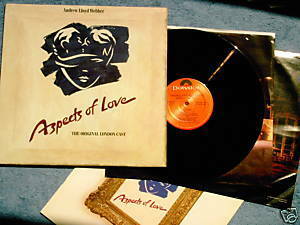 Aspects of Love 1989 Original London Cast directed by Trevor Nunn. Two LP set. Chamber opera with a cast that includes Michael Ball, Ann Crumb, Kevin Colson, Kathleen Rowe McAllen. Vinyl and gatefold cover are VG with corner crease; inner sleeves show London set; original libretto with production photos also included.